In 1921, Carlos Menendez, a Spanish immigrant, founded the Naviera Coffee Mills, named for the shipping lines that brought him to America. Working in a cigar factory by day, he roasted the coffee at night and delivered his fresh roasted blends door-to-door by bicycle each morning. 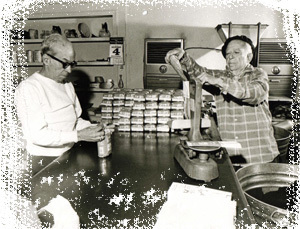 Today, four generations later, Naviera Coffee Mills, Inc. is still family owned and operated. The family and its employees take pride in the personalized service and quality that was so important to its founder. Along with expert selection and blending of the world's finest coffees, El Molino... the gourmet coffee shop, now offers you their own blends, roasted fresh daily. While you're visiting El Molino, enjoy the unique experience of seeing fresh coffee roasted and smelling the enticing aromas.